Those who have signed the letter to the British Home Affairs Select Committee include Pragna Patel, Director of Southall Black Sisters; Gita Sahgal, Director of Centre for Secular Space; Maryam Namazie and Gina Khan, Spokespersons for One Law for All; Diana Nammi, Executive Director of Iranian and Kurdish Women’s Organisation; and Nasreen Rehman, Co-Founder and Chair of British Muslims for Secular Democracy. 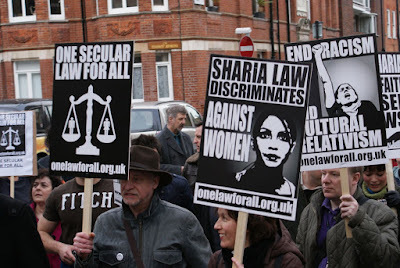 The letter says, “Many women confronting honour based abuse, for instance, will not use Sharia Councils because they feel angry and let down by their communities and religious authorities.” It adds, “They have been subject to religious abuse of power, including sexual abuse”, hence they are “fearful of being subject to further abuse and humiliation in Sharia Councils”. “The sessions consisted of three panels of witnesses. Out of a total of ten witnesses who appeared, seven spoke in favour of Sharia Councils (four of whom actually ran Sharia Councils), one remained neutral and only two witnesses – Dr Elham Manea and Maryam Namazie - were called to present their counter arguments”, the letter says.